Email reminders: Select a number of days in advance that you would like to receive an email reminder of your scheduled shifts. For example, select '5 days before' to receive a daily email reminding you of all shifts you are scheduled to work for the current date and the subsequent 5 days. The 'Weekly' option if you want to receive a once a week email reminding you of your scheduled shifts for the upcoming week. Select 'Never' if you do not want to receive any reminder emails. Do not send options: Choose as many Do not send options as you prefer. The daily reminder is controlled by option 'No reminder if I have no scheduled shifts during the reminder period'. If 'No notification for publishing of schedules in which I am not included' is selected, you will not receive a notification to view 'Requests', 'Draft', and 'Master' schedules. 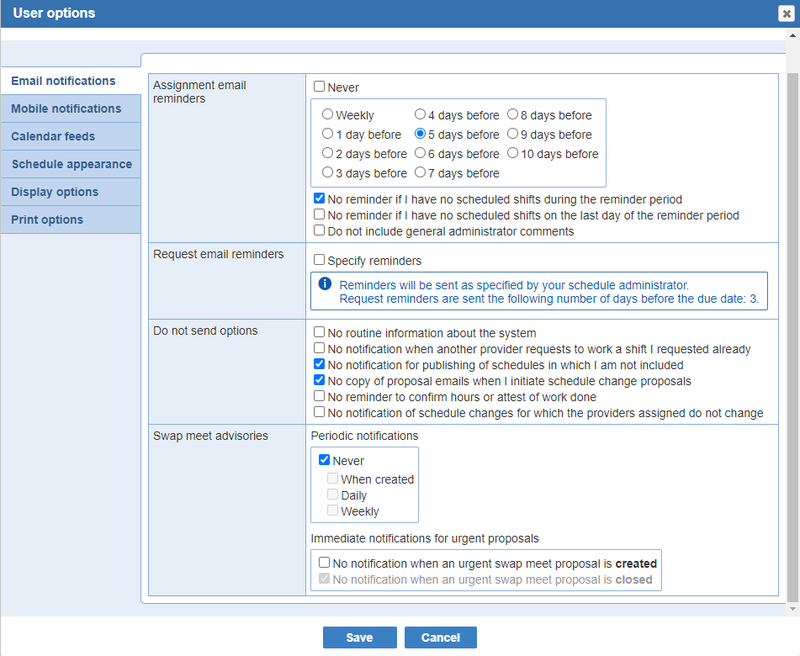 For support staff privileges only, the 'No notification of schedule changes for which the providers assigned do not change' option must be set by a location administrator. Suppress the notification when the hours are adjusted, but the shift assignment is not changed to a different provider. Swap meet advisories: The 'Swap Meet' lists shifts that are available for rescheduling. Select a check box to indicate when you want to be notified of these available shifts. Note that Swap Meet 'Urgent Swap Meet proposals' cannot be suppressed. Note: An opt out for notification of closed 'Urgent Swap Meet Proposals' is available in the user options screen. Note: If there are no shifts assigned to the provider for the days included in the period covered by reminder, the email reminder notification is not sent.